Original drawing by John Clark of the Church of St. Peter and St. Paul in Albury. 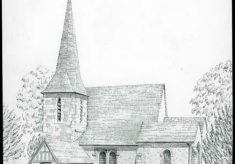 The drawing shows the side elevation of the church with two pitched roofs and the tower behind. There is a low wall and some grass in the foreground and trees in the background. Pencil on cream card. 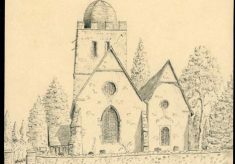 Original drawing by John Clark of the church of St. Peter and St. Paul in Godalming. 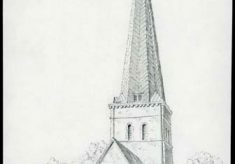 The drawing shows the front elevation with the spire and the three windows at the front shown prominently. There is a graveyard in the foreground and trees in the background. Pencil on cream drawing paper.